Harvey-Clemons had 21 tackles (17 solo) and one sack in 16 games during the 2018 season. Analysis: Harvey-Clemons only played 196 defensive snaps, getting most of his playing time on passing downs and special teams (295 snaps). 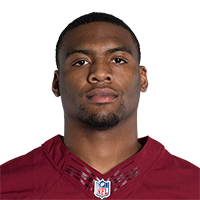 The 2017 seventh-round pick could compete for a larger role in 2019, but Shaun Dion Hamilton looks like the stronger candidate to replace potential cap casualty Zach Brown at inside linebacker. Harvey-Clemons (hamstring) made three tackles -- one for a loss -- in Friday's 29-17 preseason loss to the Broncos. Analysis: The 24-year-old has been limited in camp with a hamstring condition, but he's good to go now. Expect Harvey-Clemons to log a decent workload in Thursday's preseason finale against the Ravens, as most of the starters will be sitting. Harvey-Clemons is considered day-to-day with a hamstring injury, Kimberley A. Martin of The Washington Post reports. Analysis: It's unclear exactly when Harvey-Clemons suffered the hamstring injury or how severe it is, but he will continue to be evaluated on a day-by-day basis. The linebacker played a reserve role in Washington last season and is line to do the same in 2018 should he make the final cut. 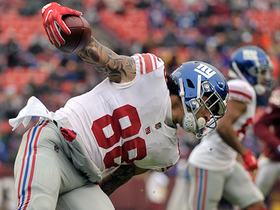 New York Giants tight end Evan Engram breaks free down the sideline for a 39-yard gain. 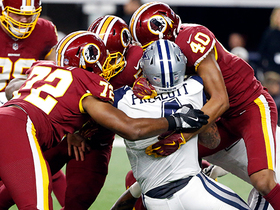 Washington Redskins linebackers Josh Harvey-Clemons and Preston Smith team up to sack Dallas Cowboys quarterback Dak Prescott.